The scooter companies are learning that cities won’t let them do anything they want — perhaps because no right-minded city is going to possibly let itself get sued over sidewalk scooter collisions. I like the scooters as a first/last mile device — and it’s obvious other folks like them because they’re motorized. But the scooters have the same challenge as bikes: finding a safe place to ride them. Environmental review now kicks off for the privately-funded project that, if built, would run between a Red Line station TBD and the ballpark’s parking lot. Attentive Source readers know that Metro is considering an unsolicited proposal for an aerial tram between Union Station and the stadium. Nice essay from a former student who rode the bus four hours a day between home and school. The main lesson: humility. Things to read whilst transiting: Gregg Easterbrook is my favorite pro football writer who is keen on shining a spotlight on the key plays you might not have noticed. Here’s his NFC preview. I think he’s leaning toward the Saints headed to the SB. I’ve also read about other experts favoring the Chargers. Holiday weekend music: look away from your computing machines, people. The article concerning the student riding the bus brought up a question I doubt will be answered since it seems my comments are either discarded or disregarded. The MTA is constantly stating they are attempting improve ridership yet have abandoned stops on every bus line within the system. As a former Bus Operator and Supervisor with the RTD/MTA I know of many stops that were busy yet the agency chose to abandon them. Why would someone, especially those with disabilities, elect to walk further in order to catch a bus? And why would someone elect to use the MTA when the agency has altered lines that now make it imperative that one must transfer numerous times in order to reach their destination when previously they had a one seat commute? I fear the planned reconfiguring the bus system will make ones commute even more difficult. The excellent service along Wilshire Bl. is a great example. Where there were two alternate routes one ending within the UCLA campus and service via San Vicente Bl. in Brentwood to the beach plus two Limited Bus routes there is but one now on the 20 line to the West L.A. Federal Building and the Rapid 720 with both having longer headways. Yes, you can still reach UCLA or travel via San Vicente Bl. or Wilshire Bl. to the beach but they require one to transfer to the Big Blue Bus which again have longer headways. But why would that surprise me when this agency builds light rail that fail to reach important destinations and fail to offer a one seat ride to places like LAX when a simple turn-out (switch) could be utilized between two rail lines that meet. Why not have an alternate route on the Blue Line connecting with the Green Line, some of the track is already in place. And why the Expo Line is at street level and the Crenshaw Line is below ground when again a turn-out could be possible for a one seat ride to the airport. One cannot say it’s impossible. Portland for example has light rail trains operating with less than a one minute headway along the same tracks to various locations. 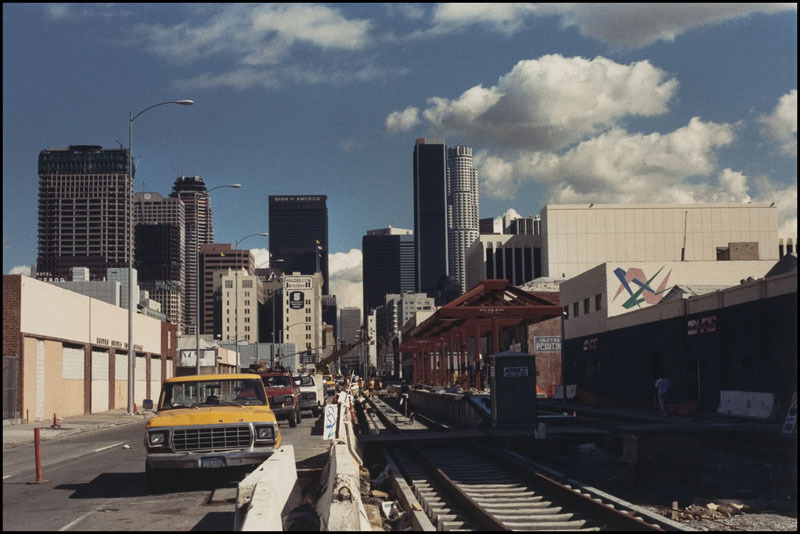 And lets not forget both the Pacific Electric and L.A. Railway did the same up to fifty years ago using only sight to separate the trains in most instances. As far as I can tell, most of your comments are published. Update your maps; still showing the old Sports Arena. Boring need to connect SpaceX/Tesla Garage on Crenshaw, Hawthorne to New Inglewood Stadium. New Clippers Arena and Forum should also have access to the Boring Tunnel. Connection with the Crenshaw Light Rail would solve the transportation gap from the Greenline.